Bankruptcy law is one of the areas consistently addressed by the U.S. Supreme Court when it is in session. This is because of the complex nature of the U.S. Bankruptcy Code, and the many different courts across the country tasked with interpreting that code and determining what it means. What often results is a mix of decisions from the different courts, each with a different conclusion to the same language in the law and similar fact patterns. In this world of legal opinions and appellate courts, this is known as a circuit split, meaning the federal circuit courts are split on how a law should apply. This is what happened over several federal courts based on the U.S. Bankruptcy Code and a provision about fraud. As a result of the “split” as it is called, the Supreme Court decided to take a case on that split and decide the law so all the federal circuits and bankruptcy courts decide these cases in unison. It seems fair to people loaning money that it not be discharged when it is loaned because of fraud. There is an exception to this general rule, however. If a statement is made about a person’s financial condition and is false, then it is not covered by the fraud rule unless the statement was made in writing. The question now before the U.S. Supreme Court on this bankruptcy issue is what constitutes a statement about a person’s financial condition. The case before the court involved a businessman who contracted a law firm for legal work. When he did not pay his bills, the man said that he would have a big tax return coming to him to pay his bills. As a result, the law firm continued to represent him. He got his return, did not give it to the firm, and later declared bankruptcy when his business failed. 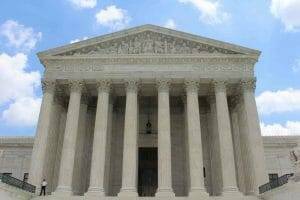 Now the Supreme Court must determine whether a statement about an asset constitutes a statement about a person’s financial condition. In which case, it will only be covered by the fraud provision of the Bankruptcy Code when such a statement is in writing, and not just based on something the debtor said. As you can see, a bankruptcy in federal court is quite complicated. The laws involved are extensive and there are numerous court decisions that must be known about and understood to effectively file for bankruptcy. That is why you need the right legal team on your side, helping you. That is what we offer you at the Bankruptcy Law Center in California. Contact us today so we can help you understand what your options are.